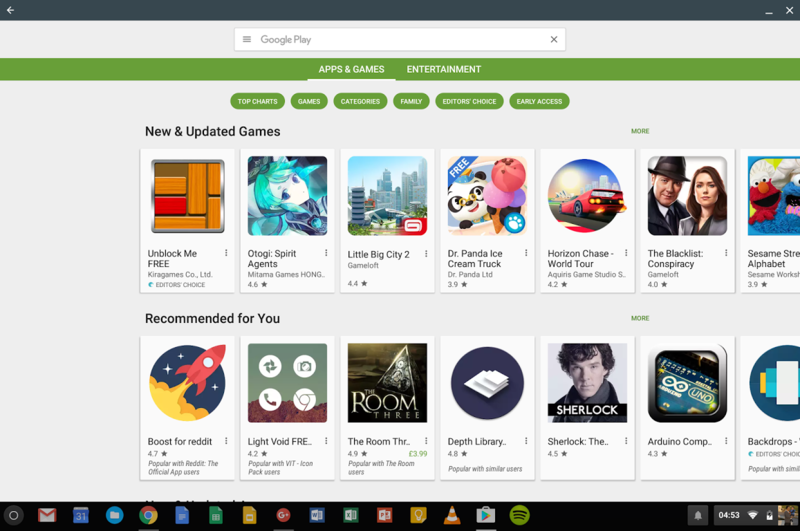 A few days ago, Google released Android apps to two Chromebooks: the Acer Chromebook R11 and the ASUS Chromebook Flip. These arrived with version 53 of Chrome OS, on the stable channel. However, the Chromebook Pixel 2, which has had Android apps in beta up until now, has been waiting for the stable release. This painful period is over, Pixel 2 owners, because you too can now join in on the Android fun with the release of stable Chrome OS 53 to last year's flagship Chromebook. From what we can tell, it works the same way as it did on the beta. Simply launch the Play Store app from the app launcher, wait for it to set up, then you should be able to download Android apps from the Store. It is possible, however, that some apps will be buggy, crash, or have missing features, because they were built for phones or tablets, not laptops. Many apps work though, such as Microsoft's Office Mobile apps for typing up documents or doing sums, and games such as Hearthstone or Crossy Road. Another thing to keep in mind is that these apps were built for touchscreens, so using them with a mouse and keyboard may not give the best experience. As for when other Chromebooks will get Android app support, we don't know. There is a list of Chromebooks that Google says it will be supporting in "2016/2017," but your guess is as good as ours as to when the functionality will be live. Just got to be patient and wait it out.